Holster your weapon on your back, hip, or holster. Weapon models will now be returned to you when unlinked. 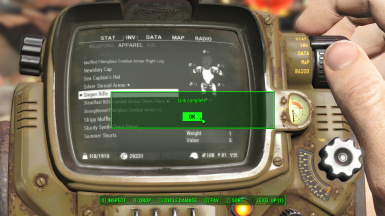 Fixed config item being given before the player has a Pip-Boy when starting a new game. 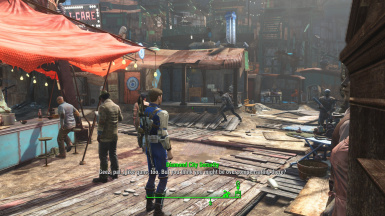 Fixed issue where mod would stop working after entering Power Armor. 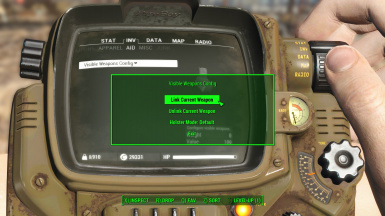 Mod authors can now pre-link visible weapons for custom weapons. Pre-linked weapons show right out-of-the-box and require no configuration. Support for empty holsters when weapon is drawn. Fixed issue where if you had more than 3 of the same weapon models in your inventory, it wouldn't unequip. You. Keep your weapons where I can see 'em. First things first - I want to be upfront on a few things. This mod won't work alone. You need weapon models as apparel items for the weapons that you want to see on your back / hip / holster. These are a small selection of mods that I've personally used. There may certainly be more that I've missed! 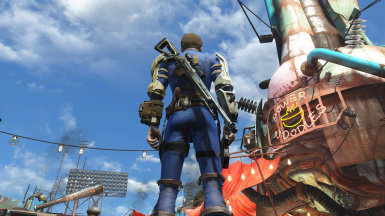 If your mod provides weapon models / holsters as apparel items, let me know - I'm happy to link to them. 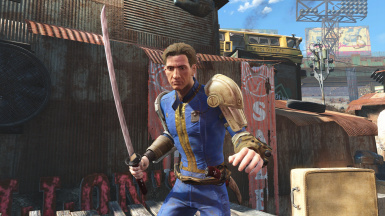 Works great with Armorsmith Extended's Sniper Rifle on Back, Katana Belt, and Pistol Harness. Nanosuit Accessories' Pistol Holster is also compatible. Weaponsmith Extended (coming soon) will soon include wearable weapons for all included mods! 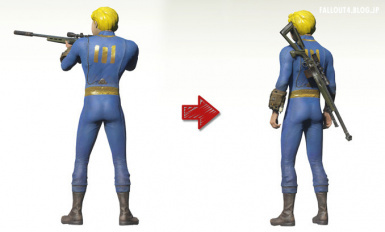 Can also be used with Outfit Switcher to change your loadout when drawing or holstering your weapon. MOD AUTHORS: You can now have your weapons visible out-of-the-box without adding any external dependencies. See the Mod Authors' section below. but now that you can actually use them, this might change. make a request to your favorite mod author to include the weapon model as an apparel item! Weapons as apparel on your back and in holsters have been around for a while now. But so far, they've been mostly useful for screenshots because they aren't actually usable! They stay on your back all the time, and nothing kills immersion more than seeing them stay static on your back when you draw that exact weapon. They clutter up your inventory too. Visible Weapons lets you link up weapon and weapon model. Once linked, they function as one item. When inactive, weapon models won't show in your Apparel inventory. That's right! Once you equip a linked weapon it shows up on your body! Once installed, you will receive Visible Weapons Config in the Aid section of your Inventory. Use it to configure a one-time link between your desired weapon and weapon model. Ensure the weapon you want to link is currently equipped, and select Link Current Weapon. Then choose the weapon model to link it to. This item must be in the Apparel section of your inventory, not the Weapons section. Now, once you equip a linked weapon it will show up on your body. 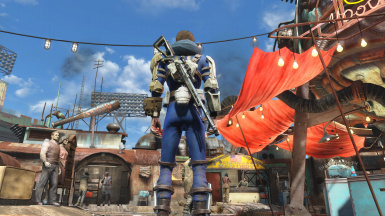 Weapon stays on your back/hip/holster if you holster your weapon first before switching it out for another. it's as if you've "thrown" your weapon to switch it out for another and it won't be holstered. e.g. a sniper rifle on your back while using a pistol. Only currently equipped weapons show on your body. 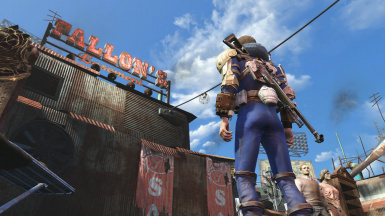 Exactly how Fallout 3 and Fallout: New Vegas handled it! For holsters. Ensures that the holster stays when your weapon is equipped. ask your favorite mod authors to include the weapon model as an apparel item! Q: I get Link Failed! when trying to link my weapon. A: You are wrongly selecting the weapon instead of the weapon apparel item. The linked item must be in the Apparel section of your inventory, not the Weapons section. You don't need to select the weapon you want to link. The Config will automatically determine the weapon you have currently equipped and link your selected item to that weapon. Q: I've lost the configuration item / haven't received the configuration item. Q: What does this mod do, exactly? Q: Does this automatically work with any weapon I have? A: Short answer, no! What I've done here is create a framework that allows for automatic equipping and unequipping of apparel pieces when you draw and holster your weapon. You'll need weapon models as apparel pieces for the weapons you want to show up. I hope you understand that this is just the beginning to, hopefully, something more. Modders can create weapon models for your favorite weapons and optionally pre-link them so that they work seamlessly and without needing any user configuration. At this point in time, there aren't a whole lot of weapon models available as apparel items, although there are modders that are working on creating more. Once again, this is the framework! Q: I want to uninstall Visible Weapons. A: Run the console command cqf holster uninstall. This will unregister all events, clear all links, and prepare the mod for safe removal. For mod authors - you can have your weapon be visible out-of-the-box, with no configuration needed on the player's end! If your user doesn't have this mod installed, there are absolutely no side effects. But if he or she does, then your weapon model will automatically show up once equipped. Decide whether you want to put this in your main ESP or as a separate optional ESP. No dependencies are added to your mod. No master files. Your mod is still completely standalone. There is an ESP in the Files section with a template set-up for your reference. These three steps will set your custom weapon up for display. 1. Add the LinkActivate keyword (FormID: 0002B79C) to your weapon. 2. Create a FormList to specify the holster mode for your weapon, your weapon model and optionally an empty holster model. The first item in the FormList is holster mode. 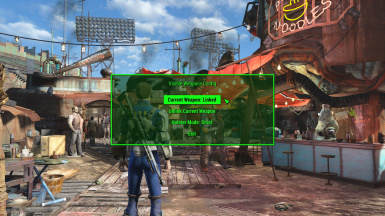 Right click on the field in FO4Edit and select Edit. Then type in either 1, 2, 3, 4, or 5 corresponding to your desired mode. (The modes are listed above. Mode 5 is Persistent + Always.) I recommend that you set this to 3 for most weapons - this is Strict mode, and ensures that your weapon only appears when equipped. This is the clearest way to show your weapon so that your users aren't confused whether your weapon is actually currently equipped. The second item should be pointed to your weapon model apparel piece. The third item is optional, and is for specifying an empty holster model. If you don't have one, there is no need to fill this in. 3. Ensure your FormList is the next FormID after your weapon. E.g. if your weapon is 01000800, the FormList needs to be 01000801. 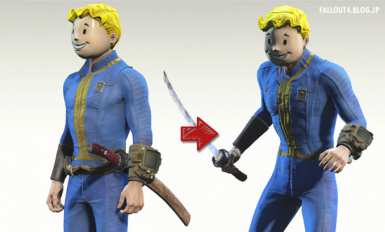 FormIDs can be changed in FO4Edit. This is important - if it's not the next successive FormID, the link will fail. That's it! Your weapon is now prepped to be visible without any configuration required. Your users won't have to craft any apparel items, do any manual configuration or even see the Visible Weapons menu. 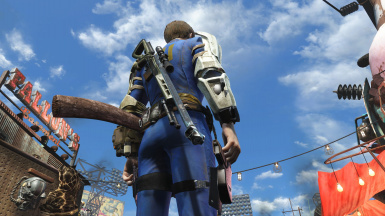 When they equip your custom weapon, it'll show up on their back / hip / holster. It just works! Send your companions to their original homes or to Home Plate. Save entire loadouts and swap between them via hotkey. It's like favorites, but entire loadouts at a time. Hotkey anything to any key, including equipment, items, and even console commands. Shout to your companion from wherever you are. Position them, switch up their equipment and be a lot more tactical in your fights. New gameplay mechanic - 3rd person cover system! Take cover behind objects and automatically lean out to shoot when you aim down sights. Gives you a personal journal that you can type in.